Every Therma-Fuser™ Motorised VAV diffuser is a VAV zone of temperature control providing pleasing comfort in both heating and cooling. A wide range of control is available with comfort set points adjustable from 13-35˚C. The electric motor delivers a consistent response for control of room temperature, and when required, a quick response to commands. The Wall Adjuster provides easy access for unit configuration and for the occupant to adjust comfort set points. The need for any maintenance or repair is minimized through the robust design and a brushless DC stepper motor specifically selected for a long life. The electric motor directly drives a threaded shaft connected with a linkage to the dampers eliminating the need for a failure prone gear box. The control algorithm reduces the motor run time to a minimum reducing energy use and extending the motor life. And, should maintenance be required, the unique design allows for easy access to the motor from the room without removal of the diffuser from the ceiling. Model MF Therma-Fuser diffusers are nominal 600mm square ceiling diffusers with built in DDC controller, temperature sensors and VAV damper. Four damper blades open and close to meter air flow (hot or cold) into the room in response to room temperature. The dampers are modulated by a brushless DC stepper motor. The electric motor, rigorously tested to provide many years of reliable service, directly drives a threaded shaft connected with a linkage to the damper blades. The controller uses an ‘expert system’ control similar to having an “expert” sitting there making the adjustments. Unlike PID control, ‘expert system’ control does not require field tuning. Every 10 seconds it determines if the flow should be adjusted and the amount of any adjustment based on temperature relationships and the rate of change. For more information contact ecoHVAC. 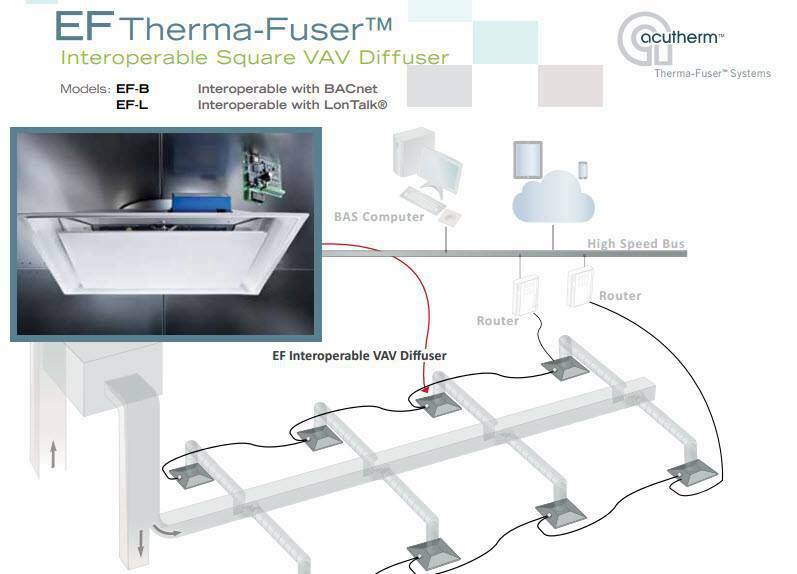 An Interoperable VAV Diffuser (EF Therma-Fuser) that works with your Building Automation System? Yes! Designed similarly to Acutherm’s independent models, the E-series Therma-Fuser diffusers recognize changes in room conditions and adjust control output for optimal performance. The result is individual temperature control that precisely matches the comfort requirements of the room. Acutherm Interoperable Therma-Fuser diffusers are specifically designed for application in multi-vendor DDC building control networks that use LonWorks® technology. As a supporter of LonMark®, Acutherm is working to make interoperability easy. All E-series Therma-Fuser diffusers are compliant under LonMark® interoperability guidelines. • Superior air distribution – longer throws, no dumping, more entrainment, even temperature distribution, higher ADPI and better ventilation effectiveness. • Lowest cost per zone of control. • Lowest energy VAV terminal – green VAV. • Low to no maintenance and no need for field tuning or calibration thanks to highly reliable thermal actuators. • Easily adapts to office changes. To learn more visit www.ecohvac.com.au. Therma-Fuser diffuser is a fully integrated, independent zone VAV control system including thermostat, modulating damper and diffuser in a single package. Unlike conventional building controls, Therma-Fuser diffusers require no wiring and operate automatically and independently. Therma-Fuser diffusers require little or no maintenance. 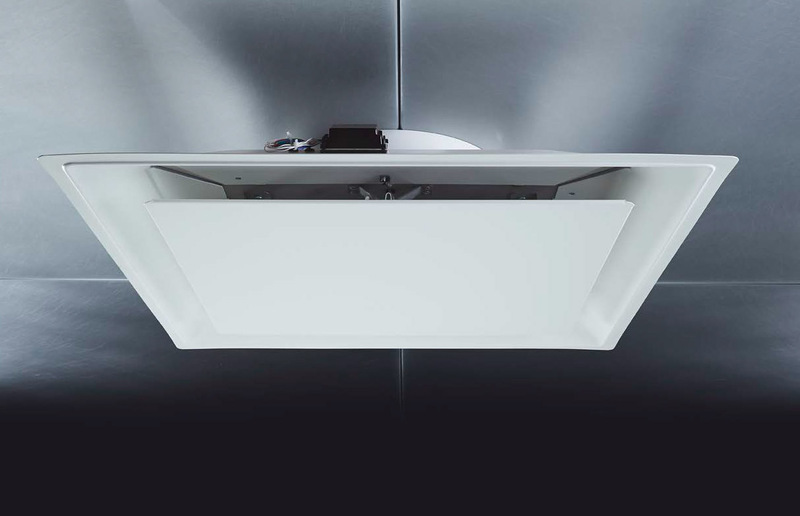 Therma-Fuser diffusion dampers operate by opening and closing automatically to regulate air flow into the room in response to room temperature. The dampers are mechanically actuated by thermal element thermostats. Each thermal element thermostat is a small brass cylinder containing petroleum-based wax. The wax expands when heated, driving a piston out. A spring retracts the piston when the wax cools and retracts. The movement of the piston either opens or closes the air dampers in a proportional manner. With Therma-Fuser diffusers, room temperature throughout the room can be held within 1 1/2º F of the temperature selected. Temperature of the room is selected between 70º and 78º F by adjusting the thermal element thermostat. 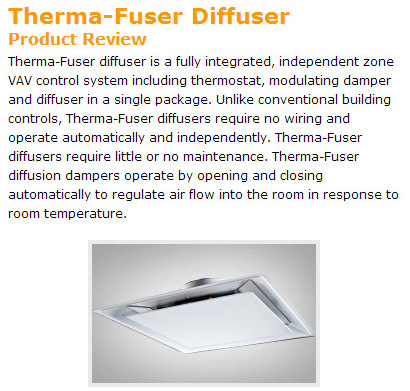 For additional information on the Therma-Fuser VAV Diffuser visit www.ecohvac.com.au. 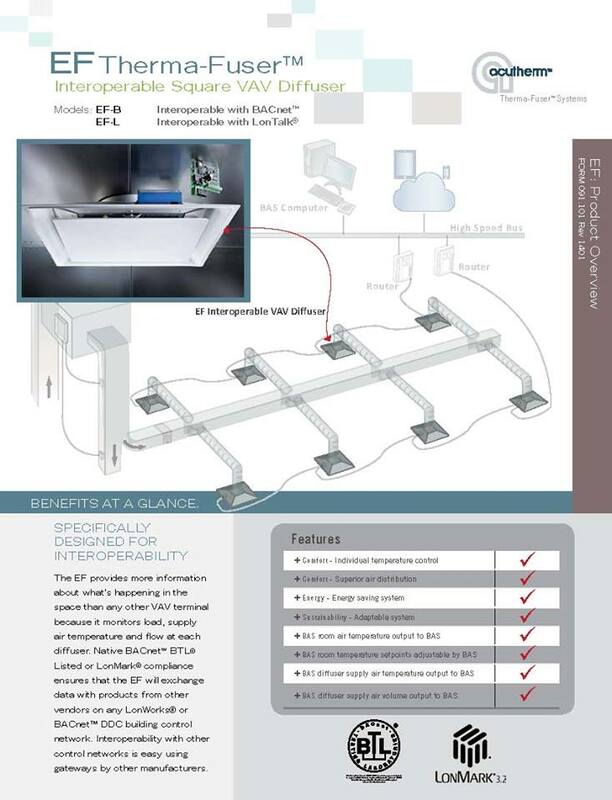 Acutherm Therma-Fuser™ VAV Diffuser System, recently joined and integrated their products BACnet International. As a silver member, Acutherm joins over 80 of the leading building automation vendors in the world in pursuing advancement of this communication protocol. 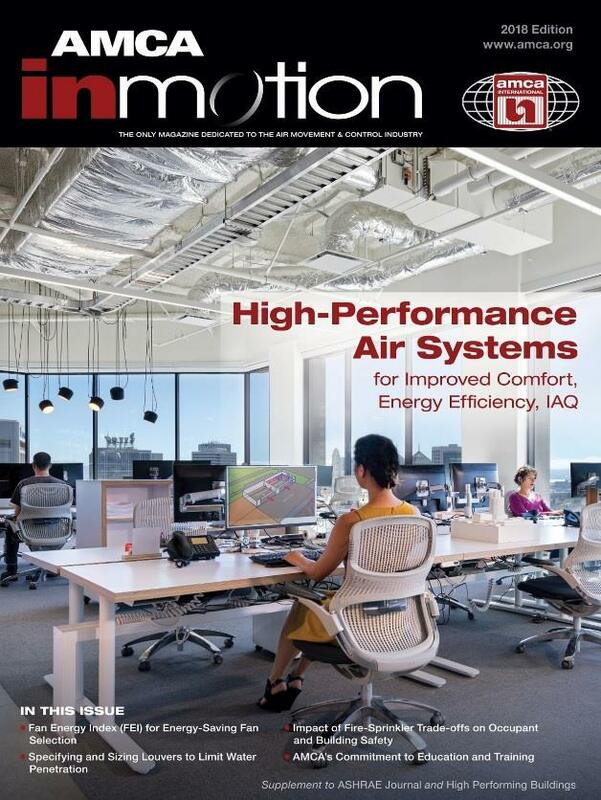 Acutherm manufactures components for heating and air conditioning systems that make commercial buildings more comfortable, save energy, offer sustainability and can also reduce total installed costs. Our components are called Therma-FuserTM variable air volume (VAV) diffusers. They are used in VAV air conditioning systems which, instead of varying the temperature of the cooling air, vary the amount of the cooling air to maintain even room temperatures.